Here is a bit longer commentary by Larry Cornett, posted to Facebook late this afternoon, Friday, September 27th. * It would cost money to save them. Most of the above rationales could be applied to trees throughout the city, etc. As a result it looked like the government was going beyond what is reasonable to try to justify the removal of most trees from the park to try to make their removal as part of the proposed remedial action more acceptable. That approach backfired. Given the amount of time that has passed and natural removal mechanisms, it is reasonable to assume that the current surface topsoil (0-3” to 0-6”) have PAH levels at equilibrium with contaminant transport mechanisms from subsurface soil due to natural bioremediation. Until the topsoil, etc. are sampled and analyzed, no significant risk from direct contact with the soil at the surface of the park has been proven. Under the circumstances, sampling the top 3” of topsoil is needed to determine if direct contact poses a threat to public health, as alleged. Yesterday, I spoke with Partners Environmental—the contractor that did the Phase II investigation of Reed Park (upon which US EPA has been basing its planning for remediation of Reed Park). He told me that at meetings with the City of Cleveland, the health department, attorneys, etc. Partners Environmental, informed them that Reed Park presented no immediate danger to public health. (This is in sharp contrast to what the City has been telling US EPA based on the Phase II study results) However the Phase II investigation did show a need to remove and rebury or treat contaminated subsurface fill material if excavated, where and when the City does any construction in most of the park. Partners Environmental proposed to the City of Cleveland that it provide a Remedial Action Plan (RAP) and to help with specifications and bidding for the development of the park. They were not selected. Partners Environmental still has the key staff who were responsible for the Phase II investigation, and their experience could help EPA and their contractors avoid re-inventing the wheel in the development of an appropriate remedial action plan for the Park if hired to help in this work. economics – Is the value of a tree $193,250? Here is an interesting sign I first saw on Facebook. There will be much quibbling over the numbers, but one thing remains clear: Mature trees have great value for many reasons. The figure, sometimes incorrectly quoted as $196,250, is cited at various green blogs, and sold on a bright red poster at Singapore Zoological Gardens, but i haven’t been able to find the study behind it. 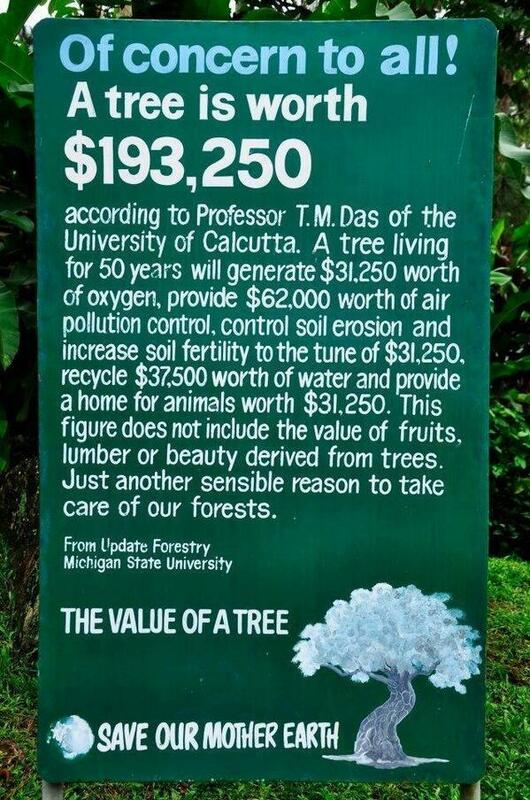 So is a tree living for 50 years worth $193,250? Here is some ancillary material Larry Cornett posted to this coming Saturday’s Facebook event. I present it here so that it will be available on the internet for a long, long time. I think the reasoning here is incredible. Whenever federal money shows up, common sense, individual rights, and intrinsic values fly out the window. * Only a few people at public meetings focused on saving the trees. We need to have activists, ecologists, arborists, and others accompany the forester and EPA in the park on Saturday. A previous brownfields study in the park showed concentrations of polynuclear aromatic hydrocarbons (PAH) above those acceptable for direct contact in the fill material sampled to depths of 2’ or 4’ in most of the park. Three to six inches of grassy topsoil has been covering most of the surface of the park and subsurface fill material for about 50 years or more. Portions of the park are also covered with concrete or sand (in the baseball diamond). Until the topsoil, etc. are sampled and analyzed, NO SIGNIFICANT RISK FROM DIRECT CONTACT WITH THE SOIL AT THE SURFACE OF THE PARK HAS BEEN ESTABLISHED, although there would be a need to rebury or treat contaminated fill material that would be excavated where and when the City does any construction in most of the park. On Facebook, Larry Cornett has publicized an event that deserves the participation of everyone who believes in the preservation of our commonly held assets, such as mature trees. Please come join the tree dialogue in Brooklyn Centre this weekend. This is an issue that affects not only our neighborhood but all of our urban areas. Please come! We need your help! US EPA coordinator James Justice has scheduled a walk through the park with ODNR Urban Forester Alan Siewert. 1. Mr. Justice thinks because we didn’t focus on the trees at the Public Meeting therefore, they are not an issue…. 2. Mr. Siewert is a FORESTER not an arborist. He sees trees from a timber perspective not an environmental and ecological perspective. 3. Mr. Siewert has identified 8 trees worthy of saving of the 61 trees in the park. WE NEED YOUR HELP! We need people there who have an environmental and ecological perspective as well as people who understand the value of urban trees to the beauty of a neighborhood. If you can, please come Saturday. If you can’t please give us arguments and reasons WHY existing trees and soil are good remediators for PAHS toxins and should NOT be removed from the park. Here’s a business that might come in handy. In our neighborhood, is demolition always the preferable alternative? What makes economic sense? What preserves value, conserves energy, and builds on the wealth bequeathed us by our forebearers? What can we do now to capitalize on land-bank lots? Only a case-by-case working of the numbers will tell. Shut your ears to all the macroeconomic platitudes you hear about how thriving communities will come about through wasting assets now. The promoters have no idea about values, or money, or communities, for that matter. The current demolition frenzy is covering up four decades of failure on the part of local leadership. Work the numbers yourself. Call Stein for a price. You can’t build houses like these anymore for a reasonable cost. Welcome to Stein House Movers Inc.! Stein House Movers Inc. is an established licensed and insured 3rd generation house moving company. Stein House Movers Inc. has been working in the heavy hauling and moving industry while proudly serving Ohio and Western Pennsylvania since 1945. We have proven to be a safe, reliable, professional house moving company with over 60 years of experience and the latest house moving equipment on the market. We can handle all jobs, big or small, residential or commercial. Call or e-mail us today to see on how we can assist you. Moving or relocating of homes: We can provide the services of moving or relocating of residential homes. We have the knowledge and capability to move homes of all building styles and sizes. We have moved everything from brand new homes to century old historic homes, and everything in between. It can be “stick” built, prefabricated, steel framed, solid stone or brick, we can move it. Moving or relocating of businesses or commercial properties: We have provided our services for moving convenience stores, town halls and school buildings. Moving or relocating of barns, pole buildings and garages: We have had the pleasure of relocating century old barns, preserving their much appreciated craftsmanship for future generations to enjoy. Basement replacement or repair: We also specialize in the replacing of basements or underpinning a new basement under existing homes. We have replaced entire basements for hundreds of families, all while they continued to live upstairs with no hassle or inconvenience. We also specialize in the repair or replacement of single walls that have failed or have been damaged. FEMA Projects: We are experienced working with FEMA in saving homes and other various structures in recognized flood zones by raising them and extending their foundations above the identified flood levels. But, not to the people of Cleveland. We just keep on paying. Correct me if I am wrong. It is my understanding that Cleveland Public Power is owned by the public who buy electricity from the company. Therefore, Ms. Harper Hall ‘s assertion that taxpayer’s money is not used for the settlement may be technically correct, but the fact that Cleveland residents “own” the utility means that it is their money used to pay Mr. Tein. Just another pocket is used.